Plumbing repairs in Honolulu for a variety of plumbing systems. Click the icons for more info about Point Plumbing's services! With 35 years experience in the plumbing industry, you know you can expect exceptional service. Over the past 23 years, our customers island-wide have looked to Point Plumbing to help solve a wide range of plumbing problems. That means you’re in trusted hands! Got a question or plumbing problem? Feel free to contact us! When it comes to water heaters, we do it all. No matter if it’s an electric, solar, or a gas water heater, we’ve got you covered. From common water heater problems, like thermostat and element repairs to water heater replacement, Point Plumbing has the experience and expertise to offer you the best solution at a reasonable price. We’ll even haul away that old water heater to save you the headache. It’s all part of our top customer service. When do you know you have a problem with your pipes? Here are a few hints! Need to install new piping for a remodel, or figure out how to reroute pipes where there are permanent walls? Point Plumbing is just the solution to help you solve it. Effectively, efficiently and with as little damage to the surrounding structure as possible. Remodeling, rebuilding or updating your home? Then you’ll probably have to consider how your water system will work with all your new home improvements. Point Plumbing can help. Our in-depth knowledge and experience on how best to upgrade or install an entire water system will really help to make the entire process less painful. From the main valve to individual shut-off valves to piping throughout your home, we can help you select the best materials, fixtures and plumbing enhancements. And we’ll do it within your budget. Preventaive maintenance is making sure that your home's plumbing is still in working order, so that it does not break down unexpectedly. Point Plumbing recommends an annual inspection on the plumbing in your single family residence or condominium to prevent flooding and damage to your own premises and to your neighbors, particularly if you live a high rise apartment building. Point Plumbing will inspect the functionality of the plumbing systems in your home, the following list is a example of what needs to be checked. Got a question or plumbing problem? Contact us, a stitch in time saves nine! When we say full service, we mean it. From sales to installation, we’re prepared for everything from pipes to washers and o-rings. Whatever your plumbing needs are, we’ll help you figure out the right plumbing fixtures and supplies to go with your home. We know how frustrating low water pressure can be and it’s usually from the following issues. So if you think you're suffering from insufficient water pressure, Point Plumbing is your remedy. Need to switch from electric to gas power? We offer a convenient all-in-one solution that takes the load off your shoulders. Our plumbers are trained in both propane and natural gas installations. To ensure all installations and gas line changes are up to code, we’ll set up the piping from the gas source to home, and test for leaks making sure everything is running correctly. An all-in-one solution that takes the worry out of your day! 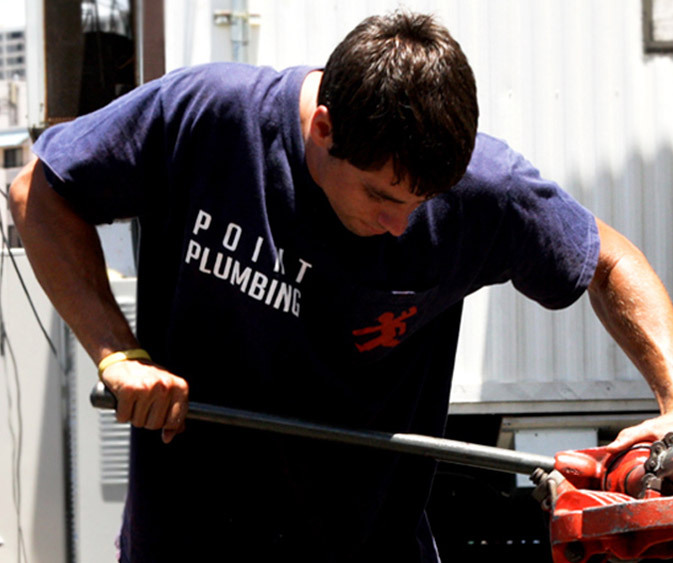 Point Plumbing has been at the forefront of Oahu's residential plumbing scene since 1992. By choosing Point Plumbing you are on a direct pipeline to successful plumbing solutions. Point Plumbing was founded in 1992 by Scott White, a thirty-year contractor of Oahu’s plumbing industry. He’s dedicated his career to ensuring that Point Plumbing clients are always just a call away from having all their plumbing problems solved. Quickly, effectively and affordably. At Point Plumbing care about what we do and the customers we work with. We bring dedication and expertise to every job, no matter how big or small it may be. Point Plumbng is determined to bring you satisfaction. It’s how we’ve earned the trust of our customers, because, at the end of the day, you’re the reason for our success. Plumbing should never be a draining experience! Please take a minute to briefly tell us about your plumbing problems. We will be in touch with you no later than the next bussiness day. Name Required Please tell us your name! Email Required Please enter a valid email! Phone Number Required Please enter a valid phone number! Home Address Required Please enter your address! Please tell us about the problem you are having! Pay the invoice we sent you either by clicking on the PayPal icon or by giving us a call. Your Satisfaction, Our Strongest Point.